When deciding between sliding shelves for server racks or fixed shelves, the concerns are about space considerations and the cost per square inch of maintaining the proper temperature and climate conditions of the space. More space used to house equipment, equals more cost. Besides the capital expense of the server equipment installation and the cost of network and Internet connectivity, the highest portion of the cost of maintaining a server farm installation is the electrical power usage. Electricity runs the installed equipment and maintains the climate control for the server room to make sure the equipment does not overheat and operates efficiently. Sliding shelves are helpful when space is limited, because they give the ability to pull the equipment forward to reach the rear connections. This is especially effective when there is more than one row of server rack installations in a particular setting. In most installations, the cables come from above and behind the server racks. There is a lot of wasted space when room is made available for a person to walk behind the equipment and gain access to the rear of the racks. By using sliding racks, the space needed behind rows of servers is less and the technicians are still able to connect the equipment to the network easily or make modifications by pulling it forward as needed. 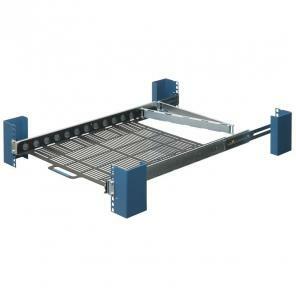 Sliding racks have the potential to reduce the space requirements in a typical server farm installation. This means they pay for themselves many times over in terms of the cost efficiency in savings on electricity. Sliding racks are good for any equipment, which needs frequent modification. Sliding racks can also be shelves to hold keyboards or equipment that is not possible to be rack mounted. Using a sliding rack shelf for a keyboard helps to maximize the use of the rack space and still gives administrators proper access to the server installation. There are sliding rack shelves, which contain a keyboard, mouse, and monitor all housed in a very thin, one unit space. The sliding rack pulls out. The keyboard and mouse become accessible and the monitor is adjustable up to a proper viewing angle for use by the administrators. Rack switches mount to the back of these sliding shelves to reduce cable clutter. In most cases, it is better to use a rack shelf with an integrated switch because installation of a switch later is more difficult. The sliding shelves come in different designs dependent on the weight-bearing capacity required. Some shelves have perforations to allow air circulation from below the equipment placed on the shelf. Other shelves are heavy duty and able to hold up to 200 lbs. of equipment and still move outwards easily based on the integrated ball bearings in the sliding mechanism. Most of the sliding shelves extend fully to give complete access to the equipment. For using a full size keyboard there are special sliding shelves that also have a rotating shelf, so when it is fully extended this shelf rotates to give the administrators the use of a full sized keyboard. For equipment that needs little change a fixed shelf is appropriate. For other equipment, that has frequent usage and changes, sliding shelves work better.